With this lively book of activities as their guide, students can follow seven scientists into their labs and out to the field to discover how evolution works. Meanwhile, you’ll benefit from the practical help the book provides with the twin challenges of evolution: what to teach and how to teach it. 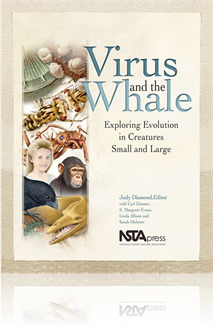 For students, Virus and the Whale brings to light some of today’s most exciting and up-to-date research through the stories of scientists who study evolution. Each featured research project highlights an important aspect of evolutionary biology, from the “arms race” between viruses and their human hosts to the long-term evolutionary changes that can turn a land mammal into a whale. The activities lead students to investigate evolution as they try out the kinds of creative thinking skills real scientists use to make new discoveries. For teachers, three preliminary chapters explain how to use the scientists’ stories as a logical framework for teaching evolutionary concepts. These chapters provide accurate natural history background; offer additional information on the evolution of each of the seven organisms investigated in the book; and introduce common ways in which children and adults think and learn about evolution. Each activity lists learning outcomes tied to the National Science Education Standards and includes assessment questions and materials lists. Virus and the Whale combines a dynamic narrative with easy-to-use activities, clear illustrations, and a welcome dose of humor.